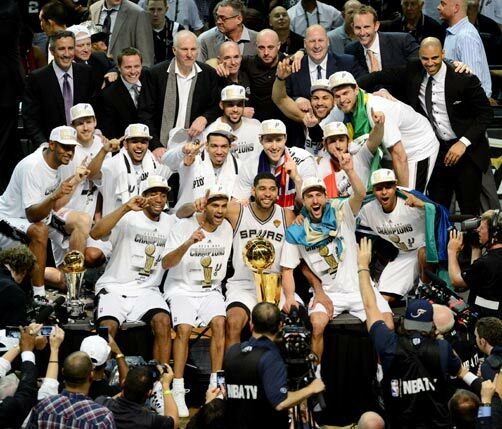 Bermudian Matt Herring said the San Antonio Spurs’ NBA Finals win will stay with him ‘forever’. As the dust settled on the Spurs’ crushing 4-1 series win over Lebron James’ Miami Heat, Herring, a strength and conditioning coach for the team, was able to bask in the knowledge he had helped the likes of Tim Duncan, Manu Ginobili and Tony Parker produce a performance heralded as one of the most complete in basketball history. It has been a gruelling season for Herring, 27, who has worked closely with the players — in Texas and on the road — en route to the franchise’s fifth championship. The final demolition job on the Heat in Game 5 on Sunday — the Spurs won 104-87 — was followed by epic celebration scenes and Herring, from Warwick, says the organization’s inherent belief in each other was the difference. It was an unbelievable experience to be a part of this championship winning team,” he said. “We had to overcome some extremely talented opposition to get through to the finals, but facing Lebron James and the Miami Heat in the Championship series was the ultimate test. “We had complete focus throughout the year and worked hard to get this opportunity. “The stress levels were very high during the playoffs but we believed in each other from top to bottom within the organization.